Bentley Commons at Bedford offers assisted living at its centrally located senior living community in Bedford, NH. When you first arrive on the grounds, it’s easy to see why Bentley Commons at Bedford is a special place providing quality assisted living. 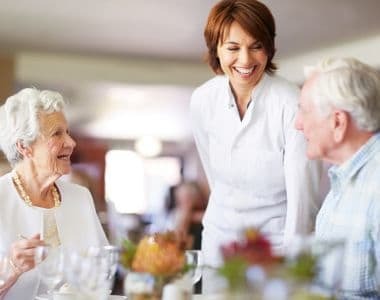 Bedford's premier senior care residence, Bentley Commons offers all the pleasures that life has to offer, while at the same time, providing their families and loved ones with peace of mind. With a dedicated staff and outstanding roster of services and amenities, Bentley Commons at Bedford is redefining assisted living excellence. Our personal care staff provide assistance with Activities of Daily Living (ADLs) including dressing, bathing, evening care and escorts to meals and activities, and other personalized services. The trained staff is there to help, as much or as little as needed, and always treats our residents with dignity and respect. It is this approach to assisted living for seniors that makes Bentley Commons stand out as a leader in senior care. A variety of studio, one bedroom, two bedroom and even companion suite options are available to residents calling Bentley Commons at Bedford home. Bentley Commons at Bedford ensures that residents are as active as they want to be, while providing spaces for quiet socializing and private contemplation. Every day, we will be living fully, creating joyously, and experiencing a rich mix of art and culture, learning, and entertainment.